We offer a number of accessories and parts for the Okatsune shears and scissors. Leather holsters for the shears and scissors for safe storage – and a whetstone for the maintenance of shears and scissors – and spare parts such as the spring. 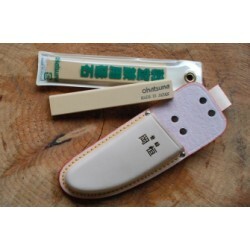 Holster is made of high quality durable leather suitable for Okatsune pruners 101 and 103. The holst.. Double holster is made of high quality durable leather suitable for pruner and folding saw. The hols..
Holster is made of high quality durable leather suitable for Okatsune bonsai scissors 201, 203 and 2..
Holster is made of high quality durable leather suitable for Okatsune bonsai scissors 200. The holst..
Holster is made of high quality durable leather suitable for Okatsune pruners 103 and 104. The holst..
Whetstone for grinding of all Okatsune products. We recommend to grind your Okatsune products regula.. Wearing gloves is a typical Japanese use. The so called ‘Gunte’ are being used in Japan for all kind..